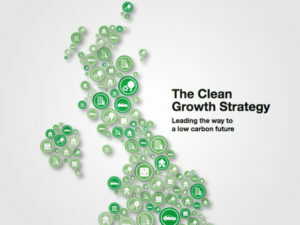 The government has revealed their Clean Growth Strategy, which outlines policies and proposals aiming to accelerate ‘clean growth’, increase economic growth and decrease emissions. The Strategy builds on the Climate Change Act of 2008, which sets out how the government will reduce emissions by 80% compared to levels recorded in 1990. To date, the government stated that 42% emissions have already been cut since 1990, yet the economy has grown by two thirds – faster than any other G7 nation. The UK government added that the 2008 Act formed the basis of the United Nations’ Paris agreement in 2016 that was agreed by 195 nations encompassing 90% of global economic activity. The government added that 47% UK electricity now comes from ‘low carbon’ sources and that average energy consumption has fallen by 17% since 1990. The new strategy aims to meet domestic commitments at the lowest possible net cost to UK taxpayers, consumers and businesses and to maximise the social and economic benefits for the UK from this transition. Key policies the government plan to undertake includes accelerating clean growth by setting up a ‘Green Finance Taskforce’ providing recommendations for delivery of the public and private investment needed to meet carbon budgets. Accelerating the shift to low carbon transport, which currently accounts for 24% of UK emissions, the government reaffirmed its proposal to end the sale of new conventional petrol and diesel cars and vans by 2040. £1 billion will be spent to support the take-up of ultra low emission vehicles (ULEV) including helping consumers overcome the upfront cost of an electric car – likely to support the government’s plug-in car, van and bike grants. Infrastructure supporting electric vehicles will be aided by a further £80 million, alongside £15 million from Highways England. Low emissions taxis and buses will gain £50 million in funding for the Plug-in Taxi programme, which gives taxi drivers up to £7,500 off the purchase of a new ULEV taxi, alongside £14 million to support 10 “local areas” delivering dedicated charge points for taxis. A further £100 million will go toward a national programme for retrofitting and new low emission buses in England and Wales. Plans for the public sector to lead the way for fleets to transition to zero emission vehicles is also underway, while a further investment of £1.2 billion will be put into making cycling and walking “the natural choice for shorter journeys”. The government saw connected and autonomous vehicles as playing a pivotal role in the near future and hoped to position the UK at the forefront of research, development and demonstration of these pioneering technologies, by way of the establishment of the Centre for Connected and Autonomous Vehicles with an investment of over £250 million, which will be matched by industry. Improvement in battery development and manufacture is also a key area the government planned to encourage, indirectly supporting the take-up of electric vehicles. This will be achieved via an investment of up to £246 million in the Faraday Challenge, announced previously this year in July. In addition, the government planned to focus on improving business and industry efficiency, which currently accounts for 25% of UK emissions. To achieve this, a package of measures supporting businesses to improve their energy productivity by at least 20% by 2030 will be developed including a rethinking of how to improve energy efficiency following an independent review of building regulations. Funding for innovation in research and innovation in Energy, Resource and Process efficiency will include around £162 million of public funds, including up to £20 million encouraging the switch to lower carbon fuels. LeasePlan UK’s managing director, Matt Dyer said: “We believe electric vehicles are what’s next and have already started working towards our ambition of all our employees driving electric cars by 2021 as well as encouraging our customers to make the switch.